Today I found out about Amy and Katie, the twins born 87 days apart. Maria Jones-Elliot of Waterford, Ireland, was just 23 weeks pregnant when she went into labour with her twins in 2012. She was understandably worried—it isn't until 24 weeks that doctors now consider a pregnancy viable (that is, the baby could potentially live outside of the womb with a lot of medical intervention), and 40 weeks is the normal gestation period. These babies wanted out early, and doctors weren't sure that they were going to be able to save them. For a baby delivered at 23 weeks to survive, is a huge achievement from everyone's point of view. 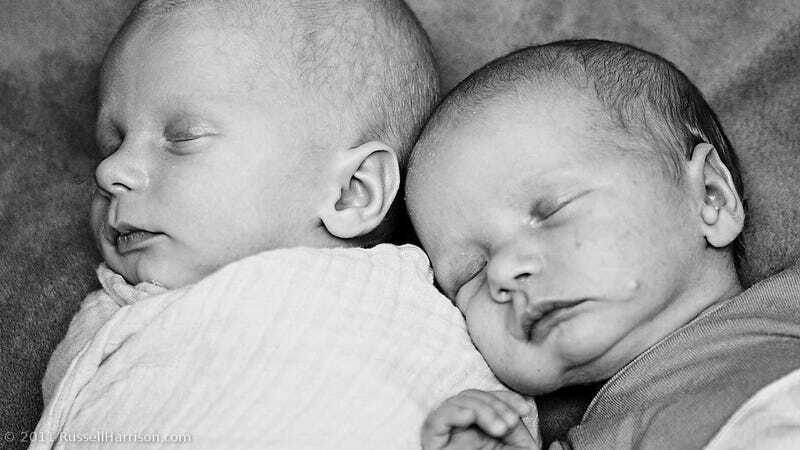 For a 23-week twin to survive is even bigger because twins often behave more prematurely than singleton babies. That really is right at the absolute border of viability. However, after Amy's birth, Jones-Elliott's contractions stopped. That meant Katie was still in the womb to cook for a bit longer—but that was potentially dangerous, too, as she was at risk of infection. Doctors decided to attempt to induce labour, but when that failed Jones-Elliot and her husband decided to "let nature take its course." Katie clung on, and Jones-Elliott was induced again three months later at the 36-week mark. Katie was born on August 27, 2012, nearly three months after her twin sister, and was almost full-term. Both babies had been due on September 21 of that year. That wasn't the end of the struggles for the twins and their parents; while Katie was deemed fine and taken home five days after she was born, Amy required seven more weeks at the hospital before she was able to be released. The older twin, being so premature, had a 35-40% chance of "long term problems" including deafness, blindness, or learning disabilities. However, against all odds, both babies are happy, healthy, and thriving today. Amy and Katie now hold the official Guinness World Record for twins with the most time between their birthdays, but they are by no means the only set of twins with an astounding amount of time between their births, and there are even a few well documented cases that haven't been registered with the Guinness World Records that beat them. Dr. O'Donnell, who was part of the twins' delivery team, said, "There were cases documented as far back as the 1800s of babies born 40 days apart." It's a rare occurrence, but not unheard of. So who held the official record before Amy and Katie? Hanna and Eric Lynn from Pennsylvania, who were born 84 days apart in 1995 and 1996. As for the unofficial record. We found a couple that were reasonably well documented in the news that beat out Amy and Katie. One of those is that of Molly and Benjamin West, born 90 days apart in Maryland in 1996. In this case, their mother went into labour when she was under six months pregnant. It was a different ball game back then—if the babies had been born just a few years before, neither of them would have survived. As it was, when Molly was delivered three months premature on New Year's Day that year, she was given just a 1% chance of survival. It was tough going, too. She battled lung disease and meningitis among other life-threatening illnesses for a premature infant. Meanwhile, her mother had been given drugs to stave off the birth of her twin, Benjamin. Every day a fetus remains in utero increases its chances of survival after birth. Mrs. West was given antibiotics to ward off infections, wore a device around the clock that pumped medicine into her bloodstream to keep contractions at bay, and continued to use a contraction monitor at least twice a day to make sure her son was staying put. In the Wests' case, Benjamin needed a bit of oxygen after he was born in April 1996, and he also had jaundice, but these were common issues that were easily remedied and he was deemed healthy otherwise. He was fine to go home, but when Molly joined him, she needed a heart monitor and still faced some long-term issues. Even the Wests aren't the unofficial record holders. That award, as far as we were able to determine among well documented instances, goes to Timothy and Celeste Keys of New Orleans, born 95 days apart in 1994 and 1995. Timothy was born October 15, three months premature. He weighed just 1 lb., 14 oz. when he was born. Like the other cases, his mother was given drugs to stop her labour to give the other twin a better chance of surviving. His sister, Celeste, followed on January 18, weighing in at 6 pounds. Timothy was able to go home the same day as his sister. He, like the others, faced long-term risks from being born so prematurely. Why are there such long gaps between some twins? For some, it's just chance. However, both the Wests and the Keys' were able to get answers as to why they went into labour prematurely. Molly West's placenta had an infection, which likely sparked the labour. As for Mrs. Keys, she had a history of high blood pressure, heart rhythm irregularity, and childhood rheumatic fever which had complicated her pregnancy from the start. Some other documented cases—including a 1952-1953 case in Sydney, Australia—saw the mother struggle with a condition called uterus didelphys, or "double uterus", which is extremely rare. Needless to say, having twins born months apart is not something most expecting mothers of twins need to worry about. The current shortest time between the birth of two non-conjoined, non-Caesarian section twins is 2 minutes, occurring on July 10, 1995. The mother of the twins was Ellen Louise Brown of the UK. Emily Upton writes for the wildly popular interesting fact website TodayIFoundOut.com. To subscribe to Today I Found Out's "Daily Knowledge" newsletter, click here or like them on Facebook here. You can also check 'em out on YouTube. This post has been republished with permission from TodayIFoundOut.com. Image by rharrison under Creative Commons license.